Get spooky! Or rather, get spooky books! Welcome to October! Ya’all know what that means: It’s time to get your spooky on! That’s right … it’s officially close enough to Halloween to break out the costumes and the candy and the books you’ll need to see you through this dark and stormy season. And you’re in luck! The Outskirts Press Bookstore is packed with great selections, both holiday-themed and holiday-free alike, that will enrich those long golden Fall afternoons and languorous evenings in your near future. From Fiction to Non-Fiction to Memoir to Children’s books, we’ve got you covered! If you’re looking to transmute the spooky into something a little darker — something more in the horror fiction vein — then Danny Odato’s The Witch’s Revenge is probably your cup of tea. Set in the Latur district of Maharashtra, this story centers on the Nehra family, loving and traditional Hindus who just happen to find themselves at the center of a growing circle of fatal “accidents.” When they suffer their own tragic loss, Padma and Mohan Nehra seek help and a series of incidents unfold to carry them into a dark and uncertain future. Here’s a book that blends Indian tradition with suspense and horror — to produce a truly fascinating read perfect for the moody and broody October weather. 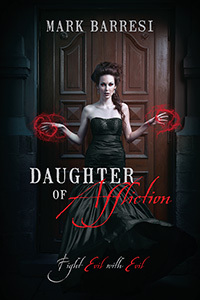 No Halloween reading list would be complete without a dip into the truly dark, and Mark Barresi’s Daughter of Affliction is here to sate all of your spooky Halloween needs. The book takes us back to 1310, a time when armies flying banners of different faiths clashed on battlefields across Europe and the Middle East. Here, the Templars ride again to save a young Yorkshire woman from her own bloodline. But in the present day, separated from those events by seven centuries, a young woman goes missing and the cycle of violence seems set to begin again — and only the missing woman’s aunt and a retired police officer stand in its way. Truly riveting, Daughter of Affliction is bound to become many adult readers’ next Halloween favorite. We’ve covered children’s picture books as well as adult fiction and nonfiction in this collection, and here’s the perfect book of juvenile fiction to round out the bunch! 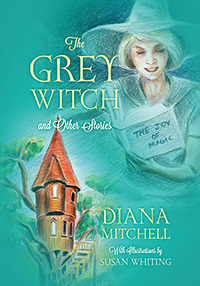 Diana Mitchell’s The Grey Witch & Other Stories sets up a fantastical world where whatever can happen often does. And in this world lives the Grey Witch, with the power to transform toys into real creatures although not always with predictable results! She accidentally turns her cat blue, sends the Coast Guard into complete confusion, and her fellow witches don’t … quite … know what to do with her. But then, that makes for a delightful kid-friendly Halloween read, which is exactly what we need right now! Do you believe in ghosts? In the 1980s, the Pennhurst State School and Mental Hospital was shut down due to resident abuse. 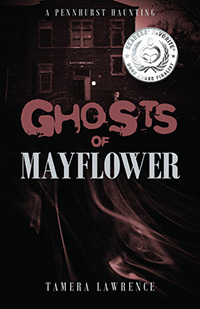 Fast forward twenty-five years, and the Mayflower building hosts a number of resident ghosts. Author Tamera Lawrence, an orderly working on the grounds, documents many of these hauntings — ones that she has experienced personally as well as those experienced by others — and traces the history of what is now known as Pennhurst Asylum. This book holds a lot of cross-genre appeal and is sure to be a hit with lovers of both memoir and the paranormal. 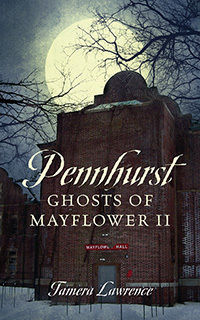 Lawrence leads her readers on a thrilling journey of discovery, documentation, and brushes with forces that defy human understanding — and her books, Ghosts of Mayflower and Ghosts of Mayflower II: Pennhurst make the perfect platform to launch your Halloween reads in October! When it comes to life, Martinka doesn’t have it all that easy. She doesn’t seem to be aging quite right, and she doesn’t seem entirely … well, mortal … and her mother happens to be somewhat demonic. There’s at least one thing Martinka does have a handle on, and that’s irony! After all, she’s made it her career to eradicate all that’s evil and demonic in the world. You can imagine that’s not going to be an easy task, especially once her mother and a potential love interest arrive on the scene. If you’re looking for a fantastic trip down paranormal lane, Martina Potucek-Palladino’s book may just be your perfect match. We have our fingers crossed for a sequel! No Halloween would be complete without a great picture book for young readers, and L.S. 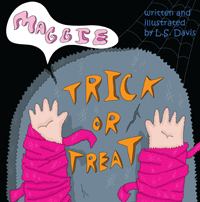 Davis delivers in his whimsical and delightful Maggie: Trick or Treat. This makes for Maggie’s third appearance — Maggie and MAGGIE are both available through the Outskirts Press bookstore but are not holiday-themed — and she just gets more and more interesting with each book! After all, who can’t relate to a little girl with a big appetite for food and for life? That’s right, nobody! Especially during the holiday season, what with all those pumpkin spice lattes and pies and whatnot! There’s always something exciting happening in the Outskirts Press Bookstore as new items are added on a daily basis. You can find all of the titles we’ve mentioned here today, and more, for sale online in our store. And if you haven’t yet published a book yourself, there’s never a better time than now to inquire. Visit us online at www.outskirtspress.com where you can chat with a Publishing Consultant or call us at 1-888-672-6657. Next Next post: Gift the Gift of Words This Holiday Season!